It’s one of those things. You live in an area and you keep putting off exploring certain parts of it because, well, you live there and there will be plenty of time to explore later. There were these buildings between Nice and Antibes that caught my eye early on. I mean, they are hard to miss. They look like a broken up Roman amphitheatre. They are massive. You can see them as you land at the Nice. You can see them if you from the beaches in Antibes. You sort of wonder what they are and then you move on and forget about it. At least if you are like me. If you are an architecture buff you go and explore. I sort of left it. It didn’t seem that there was anything there of note and as I have said, it was one of those things. And then, four years ago my friend Pierrick moved there from the Monaco area to set-up a wine store. He specializes in wines from Provence (which is just up the road from Côte d’Azur). All his wines are delicious. I should know, I have probably tasted most of them. Fantastic value, for really, really good local wines. Here is a link to his website. You should consider it, especially if your yacht (or rather the yacht you work on) is in the area. In fact, I plan to write up a blog on Pierrick’s wine. It’s that good. So these days Pierrick lives on the sixth floor in one of the wings of the massive buildings I’d been wondering about for years. His shop is just down from his place and he has a huge terrace with a spectacular sea view. In fact, all the apartments have a terrace facing the sea. Pierrick’s is a big terrace and he practically lives out there for 5-6 months a year. Something that is lacking from my life in a huge way. I would love my own private outside space. Sigh. We have a balcony that fits two people uncomfortably and is overlooking a dog poo ridden busy street. Vive la France! 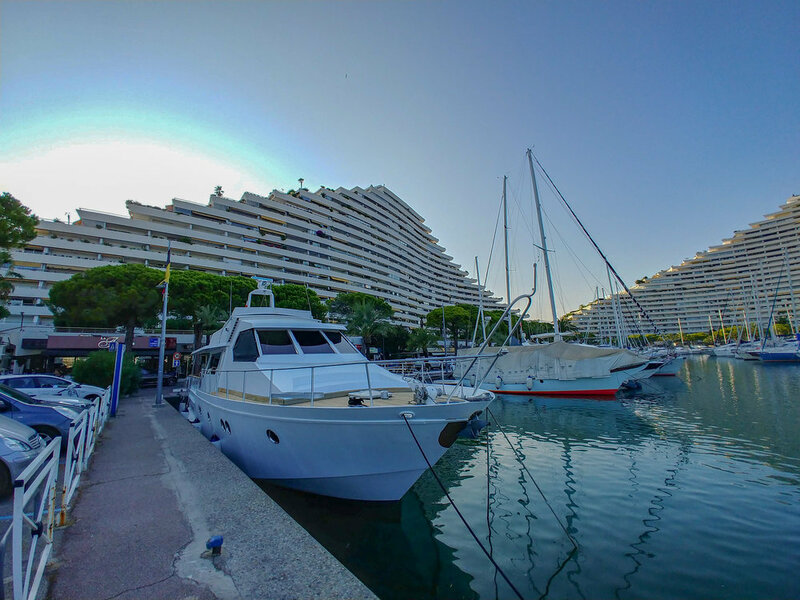 The place, the marina and the surrounding wave buildings are called Marina Baie des Anges. 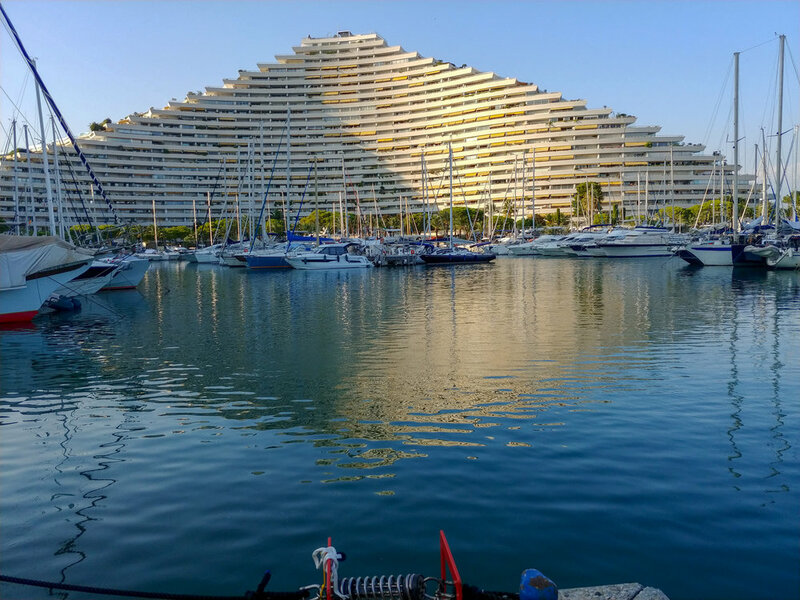 I dug this info up online: Between 1969 and 1993, a real estate program comprising a marina and four buildings (Amiral, Barronet, Commodore and Ducal) in the shape of "waves" was built by the architect Andre Minangoy. I also dug up (read came across on my google search) this little detail. In a poem titled “Adam and Eve” by Alexis de Jussien published in 1856, he explains that Adam and Eve, after they’d been driven out of the earthly paradise, were led to Baie des Anges by some compassionate angels because the beauty of this area almost matched the beauty of their lost paradise. Sounds nice and all, but I beg to differ. There are better beaches even in this area and much better and more heavenly beaches in the South of France. But there you go. It’s a nice story. 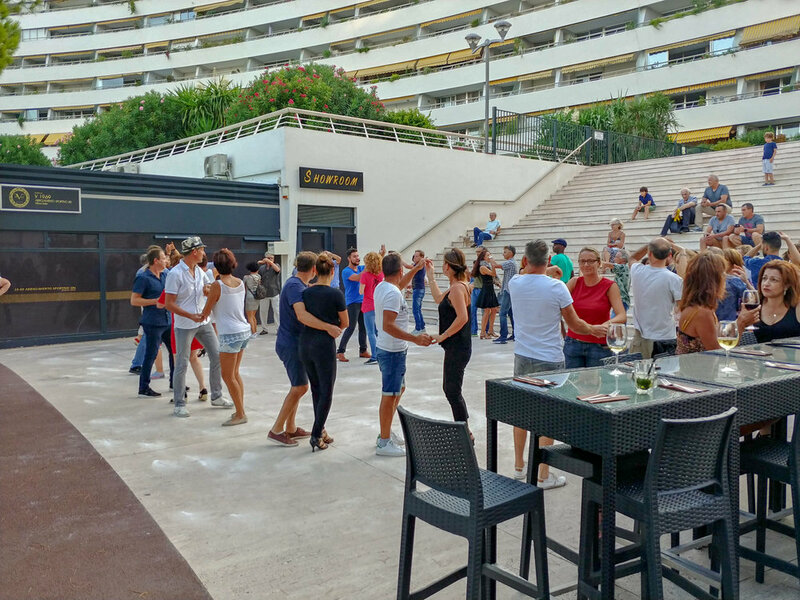 I have been coming to Marina Baie des Anges semi regularly for 4 years. You can drive on A8 or take the train. In each case, you get off at the Villneuve-Loubet exit/station. The place feels like a bit of secret, which is ironic given the size of the buildings. It is a lovely little hidden community. There is a large cycle lane, water sport rentals, a newsagent and a supermarket. 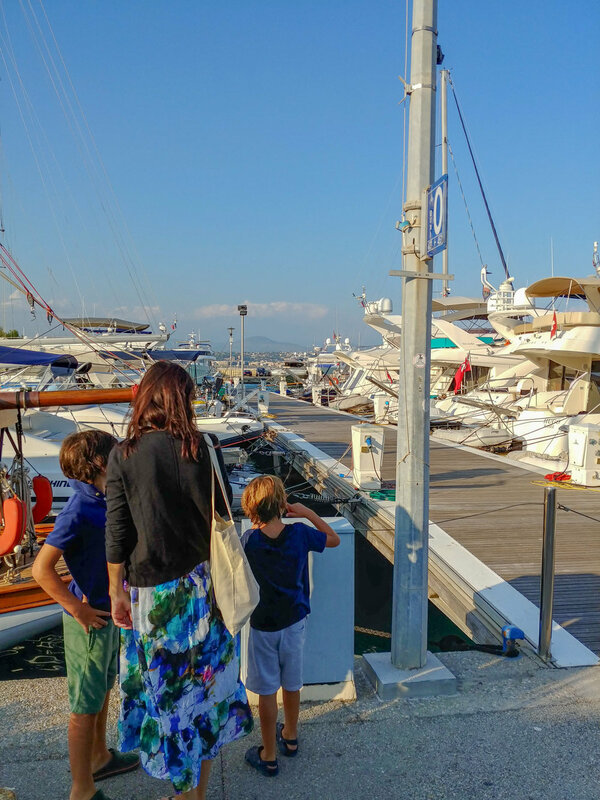 You can moor you boat in the marina as there are places for the public and you can also rent a boat. It gets very, very quiet during the weekdays of the low season. However the restaurants seem to fill up on Friday and Saturday night. During the summer months though, the place is teeming with people. I can only imagine that there are loads of holiday rentals or AirBnb places to choose from in each “wave”. 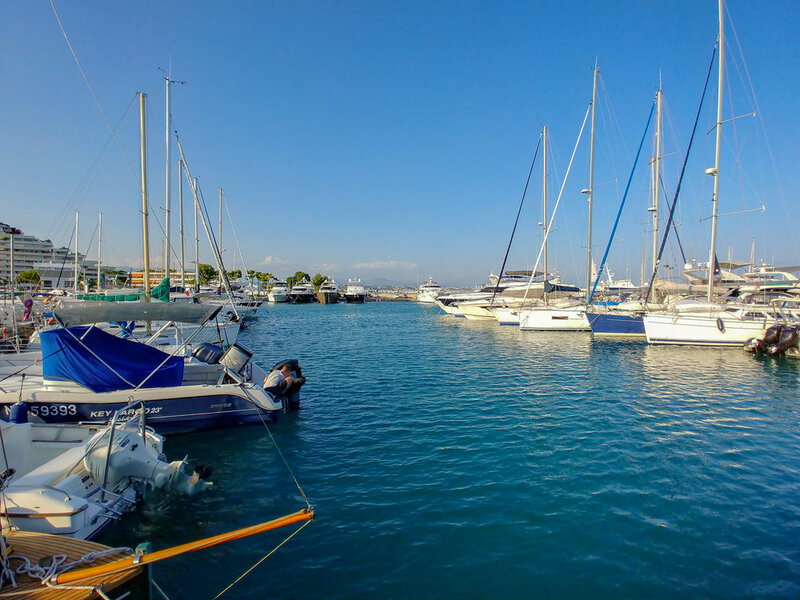 If you are after a good spot that is safe and central, you should give Baie des Anges a look. If you are feeling lazy and don’t want to explore much or venture too far, you quite literally have everything you would need for a 4-5 day break. But this location is also perfect if you want a nice base from which you can quickly get to Cannes, Antibes, Nice and Monaco. What’s also nice is that you can cycle this part of the Côte d’Azur quite easily. As I have mentioned, the closest train station is Villneuve-Loubet. From there, you’re just a short walk away. If you are driving, there are plenty of parking spaces all the way round the buildings. Word to the wise, don’t park in the delivery spaces (they marked Livraison in France). If you do, you’ll get a ticket almost instantly. Cycling lanes and plenty of parking spaces. Both are rare in the South of France.